On February 13th and 27th, the first three firings of the technical-operational evaluation (ETO) firings of the Meteor Air-Air Missile were successfully carried out at the DGA Mediterranean Missile Test Range. Led by the Air Force and the French Navy as part of the Rafale F3-R operational evaluation, these firings are the result of intense preparatory work piloted by the DGA and the French Air Force. The process involved DGA’s Operations Directorate and three of its testing and evaluation centers (missile tests, flight tests and information management), in close collaboration with manufacturers MBDA and Dassault Aviation. The long preparatory work for these ETOs was conducted in parallel with the development of the Rafale F3-R standard, in order to translate its technological advances into operational gains as quickly as possible. The evaluation gathered by DGA thanks to its integration firings of the Meteor also directly contributed to the optimization of these ETOs, by opening the way for greater complexity and representativeness for the benefit of the operational staff. It all began with a seminar bringing together the DGA and the armed forces to define the firing scenarios to be explored, namely the new operational capabilities that we seek to document. Eight themes were finally selected, including three potentially achievable on the Mediterranean site of DGA Missile Tests at the beginning of 2019. 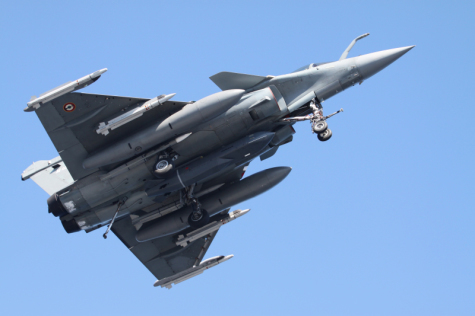 To confirm the feasibility of a thorough operational evaluation of the Rafale - Meteor pair, completely renewing the standards of the air combat, a study was initiated to guarantee not only the safety of the firings, but also how to maintain the necessary secrecy around this new capability. The preparation of complex firings such as these begin with an initial simulation conducted by DGA Information Management, to feed the feasibility study conducted by DGA Missile Tests. As soon as the feasibility was confirmed, preparatory work accelerated. DGA Information Management conducted detailed numerical simulations, in close connection with DGA Missile Tests and industry, to refine the definition of the themes. In parallel, DGA Missile Tests launched the acquisition of a telemetry system able to process secret data, as well as SSI homologation procedures (1). As one of the scenarios could not be fully prepared by simulation, an intermediate flight was conducted with the Air Force on the Mediterranean test range, allowing DGA to finalize the preparatory studies. DGA Missile Testing was then able to begin the preparation of five Mirach targets and two Banshee Jet 80s. At the same time, the new telemetry equipment was installed on the Coudon site and received their SSI certification. Finally, DGA Flight Tests’ SAMPAN trajectory radar was set up on the Ile du Levant to complete the test equipment. For its part, DGA Tests in flight provided the instrumentation of the firing aircraft (a Rafale Marine and a two-seater Rafale Air) for the acquisition of the data of the weapon system on board the aircraft, as close as possible to the missile Meteor: this is a technical novelty and allows a finer analysis after the firing. Given the stakes, DGA Flight Tests also carried out the final checks of telemetry and missile operations at its Cazaux site before the aircraft took off on D-Day. All this preparatory effort allowed the first two successful firings to take place in February, including a night firing. The third firing was carried out in late February using a Meteor missile and a MICA missile. The three firings were carried out by a Rafale F3-R. This intense collaborative work between the services, DGA and industry continues: the next five ETO Meteor shots are planned to take place on the Landes site of DGA Missile Tests during this year. Coming after the qualification conducted by the DGA, the evaluation is carried out by the services aims to verify that the system meets military requirements in real conditions of environment and use. The test is carried out on the initial series production items, and is intended in particular to set the rules of engagement and the operational envelope. When a system offers new capabilities, evaluations allow the update of the concept of employment, or the development of a new one.